How many of these classic pastries can you devour in a row? How many can you eat in one setting? Spend the middle weekend of September 2017 finding out. ÆBLESKIVER-EATING CONTESTS... at the 2017 Danish Days festival. The just-before-fall celebration is very much about Solvang's heritage, and the small pastry balls are the festivity's foodie stars. The eating contest is scheduled for the morning of Saturday, Sept. 16 and Sunday, Sept. 17, which'll send sweets mavens fork-to-fork in a sugary showdown. 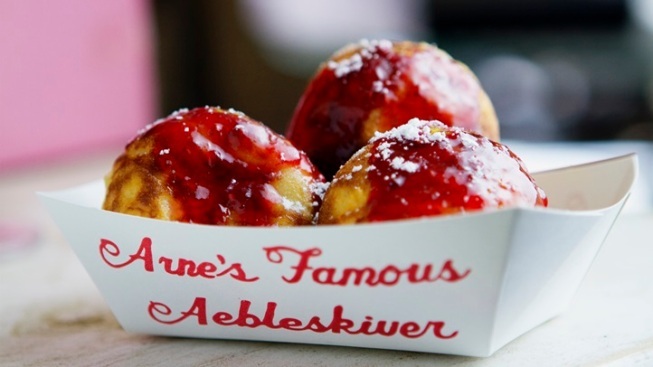 Of course, if you like to consume your confections at a slower pace, you can sign up for one of the weekend's æbleskiver breakfasts, which are different from the contests but no less delicious. Enjoying the classic treat is something visitors can do all year long in the Golden State's windmill-iest burg, but when Danish Days arrive, everyone has those little orbs of tummy-filling goodness on their mind. Whether your eat 'em fast, devour 'em slow, or split them with a friend, going halfsies on that third dough ball, Solvang's most famous foodstuff is a gotta-try-it must-have.